You, or a child you know, may have seen the Disney animated classic "The Rescuers." In the film, a little orphan named Penny gets kidnapped by two creeps and taken to a mysterious bayou where she's forced to explore for a gigantic diamond. 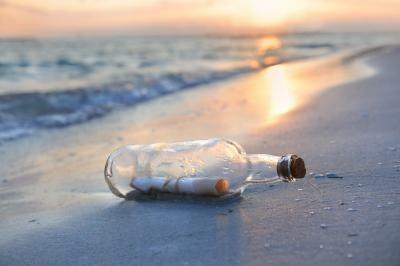 She puts a message for help in a bottle and tosses it into the ocean, where it finds its way to New York City and a group of mice that call themselves the Rescue Aid Society. Two mice set out to save Penny, succeed & find the diamond to boot. If only banks were as fortunate in tracking down customers who seem to have moved on from their past addresses, raising the prospect of unclaimed property. It's increasingly a thorny issue, as many states have drastically different laws regarding unclaimed property, and many have been making changes that make the process of tracking down customers even more difficult. While all kinds of property can become unclaimed and subject to "escheat" -- reporting it to the state and turning it over -- banks have quite a few products that can easily become dormant: checking and savings accounts, CDs, the contents of safe-deposit boxes, and property held in escrow. Dormancy can occur when the owner of an account fails to engage in any activity, or the owner of a safe-deposit box stops paying, or when customer mail is returned to the bank as undeliverable. What's challenging for banks is that many states are shortening the "dormancy period" -- the time that an asset is inactive before it's time to be turned over to the state. In fact, according to Keane (a firm that specializes in consulting banks on unclaimed property), from 2003 to 2015, some 13 states reduced dormancy periods for banking property to 3Ys. That reduces the bank's opportunity to contact the owners of inactive accounts. Current dormancy periods now range from 3Ys to 7Ys among the states and territories, Keane says. The good news perhaps is that there is an effort underway to create some consistency: The Uniform Law Commission (ULC), a group that attempts to craft model legislation that can be adopted by any state, is updating the Revised Uniform Unclaimed Property Act. The ULC first did a model unclaimed property act in 1954 but last updated it in 1995. So far, 39 states have adopted one of the ULC's models. The bad news is that 14 states, including NY, CA, TX, and DE, never have. If any state fails to adopt the latest version, due for a final reading in July, it won't be for lack of opinions. The ULC has taken a number of comment letters, including one from the ABA, which offered the sensible suggestion that if a consumer has made a deposit or withdrawal on a checking account, that activity should prevent a savings account or CD from being declared dormant if the consumer receives a consolidated statement of activity on all three accounts. Even if there's a widespread embrace of the ULC's model legislation, it will take some time for it to come into force at the state level. In the meantime, Keane has some advice for banks as to unclaimed property best practices. They say there's no need to wait until a few months before the end of a dormancy period; instead, banks can monitor accounts inactive for 6, 12 or 18 months, and then prioritize customer outreach in states with the shortest, 3Y dormancy periods. Tracking down missing customers? Banks can use multiple databases, including credit bureaus, real estate records, phone records, and the National Change of Address system. Indexing results with Social Security numbers yields better results, but not foolproof ones: there's still a meaningful error rate of identifying the wrong person. Finally, customers rarely blame themselves when their assets get turned over to the state. Instead, they blame their bank. Teaching customers about the need to keep accounts active can help avoid an unfortunate outcome. It may not be easy as putting a message in a bottle and tossing it into the sea, but it can help protect customers and the bank when done effectively. Financial markets stalled, as investors monitored conditions, following Turkey's failed coup attempt over the weekend. Yields ended flat. A survey by ACI Worldwide and Aite Group finds 47% of US consumers say they have been victims of credit card fraud in the past 5Ys, second only to Mexico at 56%. This compares to the UK and France at 29% and Germany at only 18%. European countries have long ago implemented microchip technology, a key factor for the difference. The CBO forecasts the national debt will reach 122% of GDP by 2040 vs. 107% projected last year. If so, this would mark the highest level in history. Research finds 88% of Millennials use online or mobile banking. A congressional committee has jumped into the investigation into the Bangladesh Central Bank cyber theft (using malware) of $81mm that occurred in February, as the US government begins to ramp up security protocols following this attack. After private tech security firms linked the attack to North Korea, the Treasury Department designated the country a primary money launderer and increased actions to cut it off from the global financial system. UBS reports a survey of its high net worth clients finds 84% think the US Presidential election will have a significant negative impact on their financial health, so they are holding record amounts of cash right now.